I live in a town with no drive-thru. If you want something, you park. You go in. You talk to the people who work there. The clerks and the business owners are helpful with a wealth of knowledge that they’re happy to share. Commerce goes a lot slower up here in the land of the big redwood trees. Getting things takes effort and time. Chances are, if you want something you have to drive to get it. Steep, mountainous terrain precludes most walking adventures at my age – except on the excellent trails in a beautiful State Park which lies just across the street at the end of our drive. 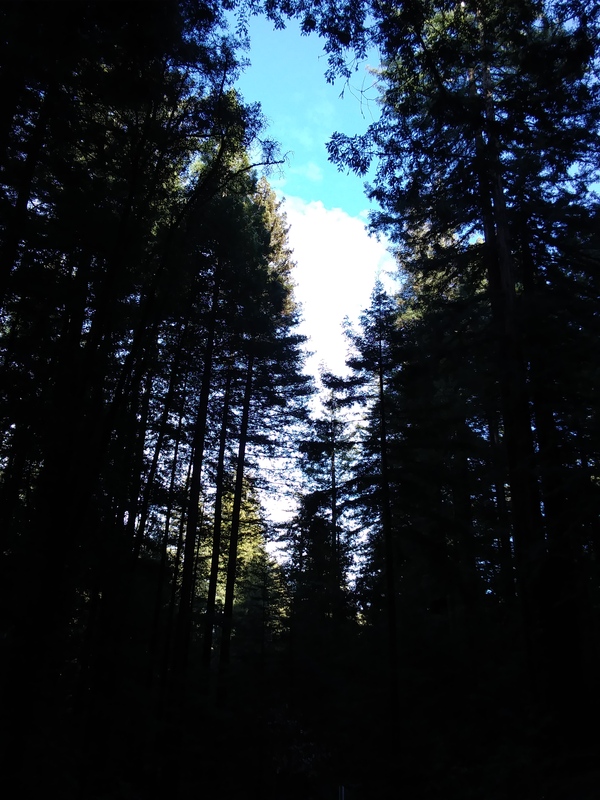 I live about a mile outside of town in the redwood forest among these very huge trees. They’re around me, above me, and just about everything I can see. Living with the trees every day makes you stop and realize quite a lot about the things you think you actually need. My daily routine here includes a morning trip into town. The coffee shop isn’t open, but the Quik-Stop at the edge of the civilized world is, and I tease the cashiers there each day as I thank them for making me coffee. It’s even free every five days. “Oh, look! You made cinnamon rolls today!” The nice people there laugh with me and wave now as I drive in the parking lot to park my car. Who else is up at 5:30 in the morning, waiting for me with a lovely cup of coffee and my choice of fruit, yogurt or danish? Just my new family in my new home. Coffee in hand, I drive for home but first, I head for the trees. Meditation! 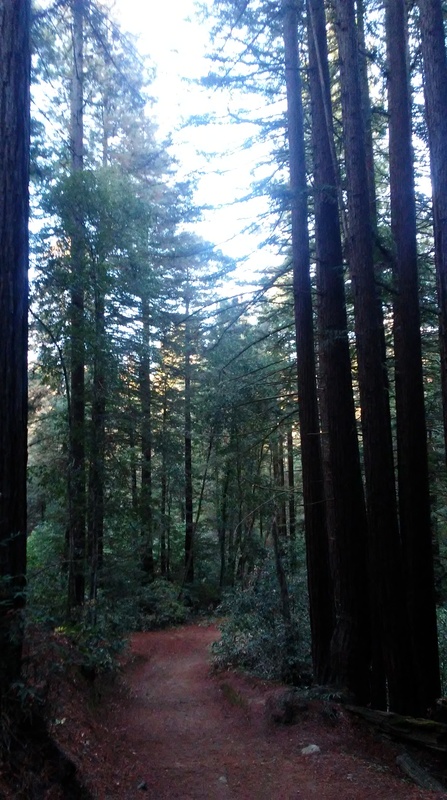 In truth, living here is an active meditation, but each morning I claim an hour to visit and exist in the presence of “my trees.” Driving some 500 feet past home to the little turnout overlooking the valley and the forest floor, I park in the utter darkness and think about them. Though they’re close enough to reach out and touch, at first, I can’t see them for the darkness. The air smells of them. I sit and wait for the sun to fill up the sky. Slowly, I can see black outlines of branches and leaves against a silver backdrop. As the sun breaks the mountaintop, colors start to arrive. Green, and gray and red and black appear against a bluing sky; “Hey everybody – Good Morning!” The trees and I – we welcome each other into the day. This morning, I sat in stillness and listened to the absolute silence around me. All I could hear was the river in the valley below; then, the sound and the wonderful surprise of a hooting owl. Other birds – doves, wrens, crows and ravens, and tiny little wood sparrows started chirping and cawing their way in. It was all I could hear. It was everything there was. I could feel myself start to disappear. Time stopped, for awhile. Eventually, I don’t know how long, a mechanical sound – a beastly thing – interrupted the moment. It was the nearby narrow-gauge railroad firing up the steam engine for the daily tours. I could hear the hiss and slurp of the train sucking up the water and starting to burn its fuel. The sound of a far off, distant car on the freeway some 7 miles away suddenly intruded. Another car, closer by this time, added its engine to the harsh human sounds. The world was waking up around me – time to go home. The story is true, if you can imagine it. I’ll suggest here that so long as you’re living outside of nature amidst a constant barrage of sensory overload, even imagining it is almost impossible. 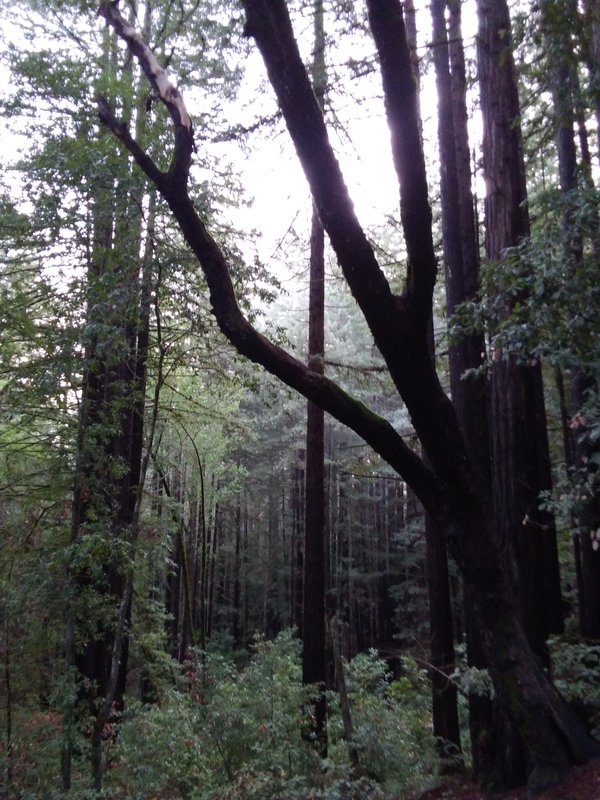 If folks living in cities and over-lit towns see a picture of a redwood forest and a nearby river, they think they can imagine (hallucinate) the stillness, the quiet, the darkness the peace of losing themselves within those trees. I’m sorry to say that momentarily calming as it might be, it doesn’t match the actual experience of living with the trees in a moment that is now; not in your body, no matter how you convince the rest of your mind. Living in a suburb in a large metropolitan area, I used to think some nights were quiet. There were nights when the only thing that seemed to break the silence was the suddenly detectable sound of a local commuter train. After 3 months of living here in these woods, those city silences are now filled with harsh invasions and assaults against me. It feels like I should duck as they hurl past me! City visits feel like tours through a war zone. You’re probably laughing at this City-gone-Country-Girl. “Buck up,” you say? “Get out of your hippie dippy world and get with the program?” On today’s overloaded, over-stimulated, time condensed, sonic speed planet, what should worry you is not my inability or discomfort handling the hustle-bustle of a noisy-normal world. It should concern you very much that your brain, but not the rest of your body, has learned to ignore it. It’s your reality. It’s determining your and inevitably, the rest of our evolution. What have we learned to ignore? For one thing, we’ve learned to ignore the trees. Back to why any of this is important – but for now, enjoy your Sunday!